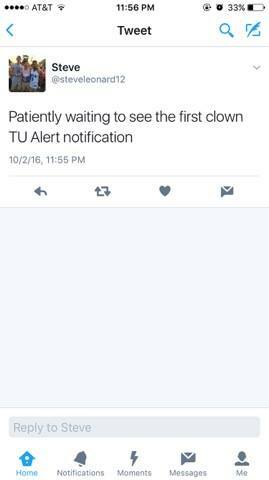 Temple University students have been reporting clown sightings near Johnson and Hardwick Hall and 13th and Diamond St., as well as in Center City near Market and Broad St.
Sarah Riley, a freshman at Temple, claims she saw a clown yesterday around 6pm when she was with her dad driving back to Temple. Riley said they saw the clown past Market and Broad St., but they weren’t entirely aware it was a person wearing a clown costume until they got closer. She said the man was wearing a full clown outfit complete with makeup, but wasn’t wearing a wig. Sarah thought she was going crazy until her father noticed the strange clown figure as well. “When I saw that I was so freaked out. It didn’t stop me from going to my night class – like I was fine walking around campus but it’s still creepy to think its happening here in the city,” she said. Around 9pm Sarah tweeted about the incident and heard from other people on her dorm floor that there were other clown sightings on 13th and Diamond. Many students are terrified for their safety, though some are very eager to come in contact with these clowns and put a stop to them. Students have also been wondering why they haven’t received a TU alert or an email from the President about the safety of the students. Campus Safety Services are still investigating the sightings around Temple. “We have gotten a couple complains and calls from students and we’re further investigating but that is all I know,” Officer Chapman told The Tab. 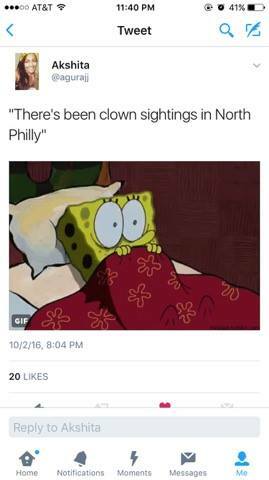 Recently there have been groups of clowns in other areas of Philadelphia targeting different school districts. Through the use of their Instagram account they’ve been posting warnings about wanting to kidnap students. 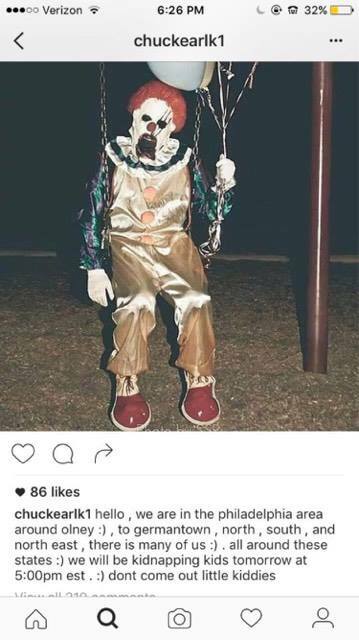 According to ABC6 News, Philadelphia police have identified a 13-year-old girl who was responsible for making clown threats at some of the local school districts, though this still doesn’t explain the sightings around campus. Sightings have also been reported around the country including Syracuse University, University of Delaware, and UMass Amherst. While not too much information has been posted regarding where these clowns originated from and why they’re doing this, their appearances have blown up on social media.